If you have ever traveled outside of the West you’ve probably been approached by someone asking for help immigrating to The U.S., or every once in a while, Canada. I got a lot of this in Asia and Africa. Sometimes it would be a checkout girl in a supermarket in Nairobi, other times it was a kid on a bus asking about college scholarships. I’m surprised that they think a complete stranger would lie for them. I saw a lot of men in suits in Africa sitting in internet cafes looking for “jobs in America” or “expedited work visas.” It was sad, really, because all of these people were going to lose a lot of money and come out without a visa. In Rwanda a man in an internet cafe asked me to translate something from English to French. I don’t speak French but I saw what he was looking at and tried to warn him. He had received an email from the “U.S. Department of Labour” about a job opportunity. There were so many red flags that it was nearly impossible to fathom anyone would fall for this. The email was sent from a Yahoo address, the logo was badly photoshopped, the body text was brown and many words were misspelled. Apparently this man had already wired the contact a large sum of money (hundred of dollars, which was probably his life savings) and received a request for more money. I explained that this was not the U.S. government and that at this point it was best to give up and accept the lost money. I can’t imagine how anyone would think the U.S. government would ask an applicant to wire money to a bank in The Congo. This man was from The D.R.C. (Congo) and was somewhat educated but not enough to qualify for a skilled laborer visa. I suggested he apply for a refugee visa, as it would be the easiest to get but his pride would not allow that despite telling me he was “going to die in The Congo.” He kept glancing back at the screen with the fake email and I insisted not to pursue it. I even showed him the real U.S. government’s immigration website. We looked at the requirements and there was no way he could fulfill them. The amount of money needed to immigrate is substantial for someone from Africa and I understand why. If someone shows up with little money and no family how will they assimilate and support themselves? He had thought about getting the money together for a plane ticket but nothing else. I felt bad breaking the news to him but can only hope he listened to me and didn’t waste his savings on an email scam. I was reminded of this encounter when I came across this interesting chart depicting the immigration process to the U.S. To read the conditions you can go directly to the large version here. Apparently even if you qualify the wait is anywhere from six to twenty eight years. Maybe I need to print this chart out and carry it around with me on my next trip to help explain just how hopeless the reality is for most people. My first morning in Kigali, Rwanda, Grace and I woke up to a man knocking on our hotel room door. It was the hotel manager, insisting in broken English, that there was a man waiting for us in reception. Despite my insistence that I don’t know any men in Rwanda, the manager was equally insistent that there was an American man upstairs that needed to see us at eight in the morning. I asked for his name and a slip of paper with an unfamiliar name was returned. Grace eventually figured out that our early morning visitor was an Israeli man she had met in Uganda. He spoke English, uncommon for Rwanda, but didn’t know who the song was by. The rest of the staff bustled around me exchanging confused looks. He explained that the song wasn’t on a CD or the radio, it was playing off the computer. Without missing a beat he suggested that he give me the mp3 if I liked it so much. I grabbed my USB flash drive from my daybag (yes, along with a compass and a knife, a flash drive is part of my daily kit) and handed it over. My flash drive usually serves to transfer non-sensitive files between my Mac and public PCs running Windows on the road. Naturally, it was riddled with viruses that don’t show up on Macs (and I can’t see) so the man cleaned the drive of viruses before uploaded the mp3. Although Rwandans appear more reserved than Kenyans and Ugandans they are friendly once you get to talking. It should be noted that, although I found the song in Rwanda, “Amanda” isn’t a Rwandan song. The lyrics are Swahili (Rwandans speak Kinyarwanda and French) and the restaurant manager guessed that it was from either Kenya or Tanzania. Sounds good to me! Please leave a comment below to tell me what you think. The main bus station in Kigali—a twenty minute downhill walk from our hotel. Rwanda is a really small country. In fact, most sites can been seen as a daytrip from the capital. Still, I felt bad coming all the wat to Rwanda only for a few days. I wanted to go chimp tracking but the National Parks aren’t very accomidating to individual tourists. Another attraction is Lake Kivu, the large lake forming Rwanda’s Western border with The Democratic Republic of Congo. Grace and I decided to head West for a day before stopping at The National Museum in Butare. Only I didn’t look at the map before setting out and realized on the way that Butare is a totally different direction than Kibuye, the town we were visiting on Lake Kivu. After two and a half hours we arrived in a tiny dusty square surrounded by shuttered shops and one twin-pump gas station. The boda-boda motorcycle taxis were typically difficult and it took us fifteen minutes to agree on a price to our hotel. The hotel was run by a church but had really cute cabins with pretty flowerbeds in front and nice landscaping. The only unfortunate thing was the location, stradling a hill jutting out into the lake. The location provided great views over the wide, still lake but meant walking up and down stairs continuously. Immediatly Grace ran into a former travel partner from Lamu, Kenya—a very pleasant Italian named Maximo—and we all spent the rest of the afternoon exchanging travel advice. An American on a internship in Kigali whom we met on the bus came by and decided to stay so we finally got a good deal on a room by sharing it between the three of us girls. With all the distractions I didn’t get as much writing as I’d like done. The lake was nice but nothing as spectacular as Lake Bunyonyi in Southern Kenya, where I’d just spent five days. After our second night we were determinded to be productive and get up early yesterday morning. I woke up at 7:30 and we managed to hitch a ride to town with an USAID car coming from the hotel. We had been told that buses leave toward Kigali every hour. My ambitious plan was to drive toward Kigali, get off at the fork to Butare, get another bus to Butare and see the museum before heading back to Kigali atbefore dark. It was doable. But then we hit a roadblock. When our USAID driver let us out at the dusty square he turned around and calmly noted that we would have some trouble because there were no buses running—it was a Gacaca day. Gacaca is a community run court that was created in each town or district to handle the enormous amount of genocide cases awaiting trial. Most of the country is on track to finish with the cases by the end of this year but Kibuye was one of the hardest hit areas and still has 3,000 cases pending. In Kibuye the whole village is shut down twice a week until Gacaca finishes for the day. We sat on some dirty steps for a few minutes feeling sorry for ourselves before another summer Aid worker showed up. She suggested we grab some breakfast and I walked uphill another kilometer with all of my baggage strapped to me. By the time I got my “omlette special” a truck full of pink-uniformed prisoners had passed wo we hurried back to town. Despite our pre-paid numbered tickets, our seats on the first bus had been given away. Grace talked her way into a seat and I waited another 45 minutes on an empty bus until we were sitting with each other’s shoulders in one another’s armpits. By then it was after noon and my masterplan was shattered. Defeated, we headed back to Kigali. The road from Kibuye winds around the beautiful mountains that makes it so beautiful but not everyone appreciates it. Like many places in the world, locals get very car sick on winding roads and this one was no exception. Within five minutes the woman next to me was dribbling vomit into her spare clothes. I figured it was a one-time ocurance but after she persisted I found an old paper bag for her. That quickly soaked through and I wasn’t sure whatto do. She was taking of her head scarf to use as a recepticle at this point and I decided to flaunt the law and took out a plastic bag. Plastic bags have been banned in Rwanda, which I totally support. So much garbage in third world countries is plastic bags, it just makes sense. But in this case I felt that it was warranted. Still, the woman hid the bag in her lap during polic checks and put it in her friend’s briefcase just before we arrived in Kigali. With extra time to spare in Kigali we stopped by the fancy supermarket for cheese rolls and diet coke and took boda-bodas out to a nice place for dinner. I had a salad and chicken with onions, tomatoes and lots of seasoning cooked in tin foil. I haven’t eated anything so flavorful in a long time. We had a bit of trouble flagging down bodas for the ride home and ended up standing under a streetlight holding grocery bags and laughing at ourselves. Finally one empty boda came by and took both of us (big no-no) to the center of town where I hopped on another boda for the rest of the ride. This morning we got off to a late start while Grace went to the bank to get some more money. She had left her remaining $28 US Dollars with the hotel as a deposit on her hotel bill while we were in Kibuye. Back to the bus station again and we squeezed into the last remaining seats on a minibus heading South. It was incredibly slow and we didn’t bother to get lunch, just headed straight into the museum. 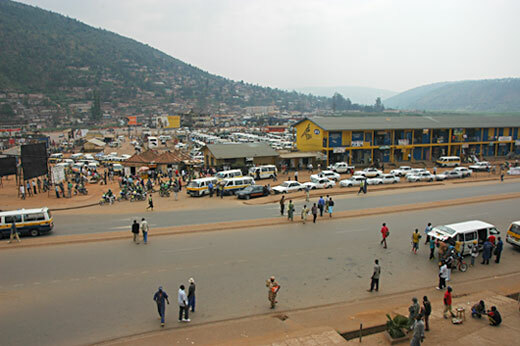 In fact, we didn’t see the town of Butare at all because we jumped out on the North end of town once we spotted the museum. The displays were really well done and I enjoyed the full size replica of a traditional straw house. A staff member thought the reason I was drawing the house was because the lighting was too low for photography. So far I haven’t seen anything like this in Africa, the closest being the tiny but interesting tribal museum in Jinka, Ethiopia. After only a little over an hour we were back in a minibus waiting for it to fill for the ride back to Kigali. This ride was enven worse because the driver stopped at every settlement of houses and for every person standing beside the road, even if they weren’t flagging us down. The two hour trip took three and a half on the way back. I managed a few cute pictures of corn vendors—my only portraits in Rwanda so far. When the man wedged beside me bought a corn on the cobb I asked to photograph it. He shook his head and when I asked again he hid it under his legs. I had never seen this before—usually a person will say no to photos of themselves but never to corn! I was confused but he seemed to understand me and finally handed me his corn then gestured to my camera. I gave him my camera and he took a photo of me with his corn. I think he was just playing with me. Just before dark we passed through one of the many police checkpoints onthe road and everyone fell silent. The policeman, in his black button down shirt and beret, asked for form after form and then instruted the driver through a battery of tests. He checked the windshield whipers, horn, lights, brakes and so on. Rwanda is serious about it’s road rules. Finally I managed to see enough of Rwanda to feel like I wasn’t skipping out but there’s something missing. It’s so quiet and orderly here that it feels devoid of the spirit that overflows from other African towns. I feel like I don’t know Rwanda like I should. I’m usually left with a strong impression of some sort when visiting a country—even after only one week. But here the genocide still looms over everything and taints the spirit of this once proud kingdom. I must admit, I find it really difficult to update from public computers. I was spoiled with my laptop and now I can’t revise my posts for days until I manage to sound funny or interesting. And now that I’ve crossed into Rwanda I have encountered the dreaded French keyboards that plagued me in Madagascar. The equally dreaded French menus aren’t so bad because I learnt most of the common words. It has been funny to see the other American I’ve been traveling with discover the frustrations of a former French-speaking colony for the first time. To give Rwanda credit, or at least the capital Kigali, there is a lot of English spoken. It also has nicely paved roads and the boda-bodas carry an extra helmet for passengers. I even had a seatbelt in the front seat of my minibus from the border! The driver must have thought we were crazy, oohing and ahhing about pavenment during the two hour drive. I have been traveling with another American solo traveler named Grace, whom I met in our hostel in Kampala. We more or less have the same plans in this area so it’s been easy to just tag along together. Rwanda doesn’t get nearly as many tourists as Uganda, but it is quite small, French-speaking and still invokes horrible memories of the genocide that happened here 13 years ago. Today was overcast and we were woken by a knock at our door by the deskman. He insisted Grace had a visitor, an American. We eventually got dressed and emerged to find the Israeli guy Grace had hung around with in Kampala. I had only changed about $10 at the border so we first stopped by a bank to draw a cash advance on Grace’s ATM card. Despite what everyone says, it is possible to withdraw money with an international card in Kigali, and only for a 3% fee. I had taken enough cash out in Kenya (Kenyan Shillings converted into US Dollars) to exchange my Dollars at a Forex bureau at a slightly better rate. The Dollar is falling against most currencies every day so you never know what rates you will find. After breakfast, where the waiter transfered a song I heard and liked to my USB flash drive, we hopped on three boda-bodas and zipped over a few hills to the genocide memorial and museum. The interior is filled with exhibits detailing to lead up to the killings, with survivor’s accounts. We had watched the film Hotel Rwanda a few days ago and I was glad to have a general idea about what happened before being hit with it all at once. The entire thing is amazing to me… that this happened so recently, that nothing was done to help, that the murderers now still live next to families they terrorized and that I never knew anything about it before I came to Africa. Outside were mass graves covered in cement holding more than 285,000 bodies from Kigali alone. Walking down the street you can’t help but look at the people, guess their age and wonder what happened to them and how they survived. For a weekday the town was quiet and most people walking around seemed unusually calm and detached—Kigali is unusually subdued for an African capital. The country is small and aside from gorilla and primate trekking and the scenery, there isn’t much of interest to tourists. I plan to head to the South of the country (a whopping two hours) to visit the national museum in Butare and then head back to Uganda. Although I would like to trek some chimpanzees in the supposedly amazing Southern national park it sounds as if I would need my own car to find them this time of year. Maybe I can see some chimps in Uganda, where everything is cheaper, in English and more accessable to individual travelers.